Wight Jewels: Senior British silver medallists 2015/16, bronze medallists 2016/17. Junior British champions for 2008/9, 2009/10, 2010/11 and 2011/12 seasons, runners-up in 2012/13 and 2013/14 (did not compete 2014/15); Junior Scottish champions in 2008, 2009, 2011 and 2013 (SK8 Scotland, event not held in 2010); Junior Welsh champions for 2010/11 and 2011/12 seasons. Members of NISA’s performance squad for 2011/12, 2012/13 and 2013/14. The Jewels competed at the Junior World Challenge Cup (JWCC) – the junior world championships – in Gothenburg, Sweden, in 2010, placing 19th. They improved their place to 17th at the JWCC held at Neuchâtel, Switzerland, in 2011. At the JWCC in 2012, again held in Gothenburg, they achieved 15th place – at the time, the highest position achieved by a British team for more than 10 years (ref: event archives at http://www.eiskunstlauf-ecke.de/). The only time a British team has placed higher was at the first ever JWCC, when only 14 teams competed (Bracknell’s Ice Metrics placed 11th). 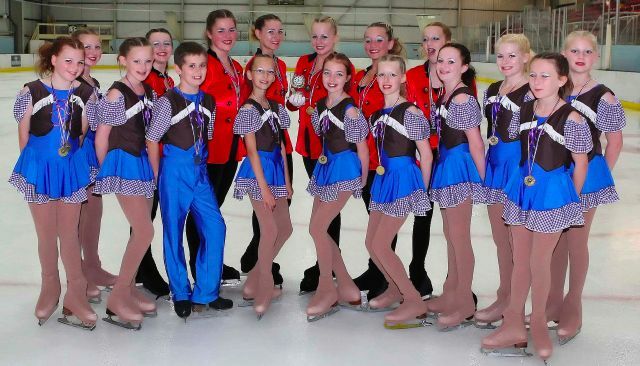 Nottingham Icicles equalled the Jewels’ achievement in 2013, placing 15th in Helsinki at the Junior World Synchronized Skating Championships – the championship event that year – and surpassed it only in 2014, placing 14th at the Junior World Challenge Cup in Neuchatel. Icicles again secured 14th place at the Junior Worlds in Zagreb in 2015. 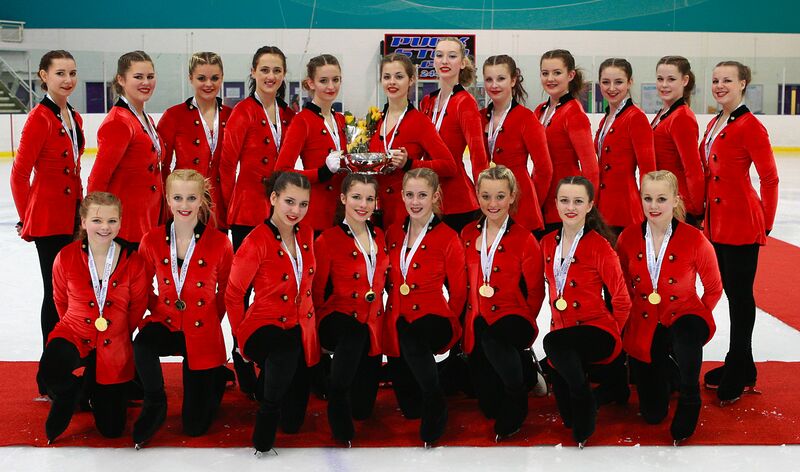 The Jewels remain the only British junior team to gain a gold medal at an ISU international event (Trophy D’Ecosse 2013). The Jewels were ranked 14th in the world, according to the ISU world standings published on 10 June 2012 (http://www.isuresults.com/ws/wssys/wsjuniorsynchro.htm; PDF archive: World_Standings_10_06_2012). They were ranked 17th in the 2010/11 season (PDF archive: World Standings 2010-11). The Jewels moved to senior level for the British Synchronized Skating Championships on 16 and 17 January 2016, where they won silver. In 2017 they won bronze at the same event. Wight Crystals: Juvenile British champions in 2007/8 and 2008/9, silver medallists in 2009/10 (won by Nottingham Silhouettes), champions again in 2010/11; Juvenile Scottish champions in 2008, 2009, 2011 and 2013 (SK8 Scotland event not held in 2010). Basic novice A silver medallists Trophy D’Ecosse 2016. Novice Welsh champions for the 2011/12 season. Bronze medallists at novice level at the 2011/12 British championships. The Crystals switched to the mixed age category for the British Synchronized Skating Championships for the 2013/14 season, held on 18 and 19 January 2014, achieving 4th place. They competed in the basic novice B group in the championships for the 2015/16 season, winning gold. They moved to advanced novice B for 2016/17, winning silver at the British championships. Wight Sparkles: A new elementary level team formed for the 2011/12 season. They made their debut at the Trophy D’Ecosse (Sk8 Scotland) in 2012, where they were bronze medallists. In 2013 they were second at elementary level at the Trophy D’Ecosse, Dumfries. In 2016 they were silver medallists at elementary level at the Trophy D’Ecosse. Sparkles were 4th in the juvenile category of the British Synchronized Skating Championships (18 and 19 January 2014). Sparkles were bronze medallists in the elementary category of the British Synchronized Skating Championships (16 and 17 January 2016). They moved to juvenile level for 2016/17. Wight Fossils: Adult level team Wight Fossils made their national competitive debut at the British Synchronized Skating Championships on 18 and 19 January 2014, placing 9th. They achieved third place at the championships on 16 and 17 January 2016. Following the closure of Ryde rink in 2016 the team disbanded. Wight Sequins: A new team for 2016, the Sequins decided to carry on competing at elementary level despite the closure of Ryde rink. They achieved fourth place at the 2017 British championships. Wight Gems: Silver medallists Preliminary level in British championships 2009/10. The Gems have had two incarnations (the 2006/7 team turned into the Diamonds when the original Diamonds became the Jewels). Team not active; retired in the 2011/12 season. Wight Diamonds: Novice British champions in 2007/8; Bronze medallists at elementary level at SK8 Scotland in 2007. Team not active; members formed the Wight Jewels in late 2008. In 2016, two founder members of the Diamonds, Isabelle Coeshott and Sabrina Danzig, were still competing with the Wight Jewels at senior level; another original Diamond, Gemma Marsh, is a member of six-times world senior champions Team Surprise of Sweden. Please note that as websites change ownership or management, links to competition results can be lost. Wight Sequins, fourth (elementary), score 14.89. Awarded most entertaining programme. BFSC refers to the British Figure Skating Championships; BSSC refers to the British Synchronized Skating Championships & National Opens. In years where synchronized skating happens at both the national and the synchro events, the BFSC is the national championship event for Senior, Junior and Novice levels, and the BSSC is only an open competition at these three levels, not a championship event. Yes, it is confusing. In the 2009/10 season, synchronized skating did not take place within the BFSC, and so the championship event was the BSSC. For the 2010/11 season, NISA again incorporated the Senior, Junior and Novice synchronized skating classes into the British Figure Skating Championships, and moved this event to early in the season (November 2010) to allow individuals and teams to meet the criteria to participate in international events. In 2013/14, synchronized skating was again moved out of the BFSC: the separate synchro championships was more simply called the British Synchronized Skating Championships. The BSSCNO is the championship event for the lower levels of synchronized skating, such as preliminary, intermediate, elementary and juvenile.